We believe this is the best guide to the Torres del Paine Circuit Trek, in-print or online. This guide was inspired by Alison and I finding a scarcity of accurate and up-to-date information on how to plan for trekking in Torres del Paine. In fact mainstream, supposedly reputable materials about the trek were missing essential information, out-of-date, or just plain wrong. Here is the information gathered from our recent Circuit Trek in Torres de Paine. Glacier Grey, a 7 km (4.5 mile) wide river of ice that flows down from the immense Heilo Sur (this Southern Patagonian Ice Field is the second largest non-polar ice shelf). Glacier Grey’s origin from the Heilo Sur is at the upper right of the photo between the snow covered mountains of the Southern Andes. 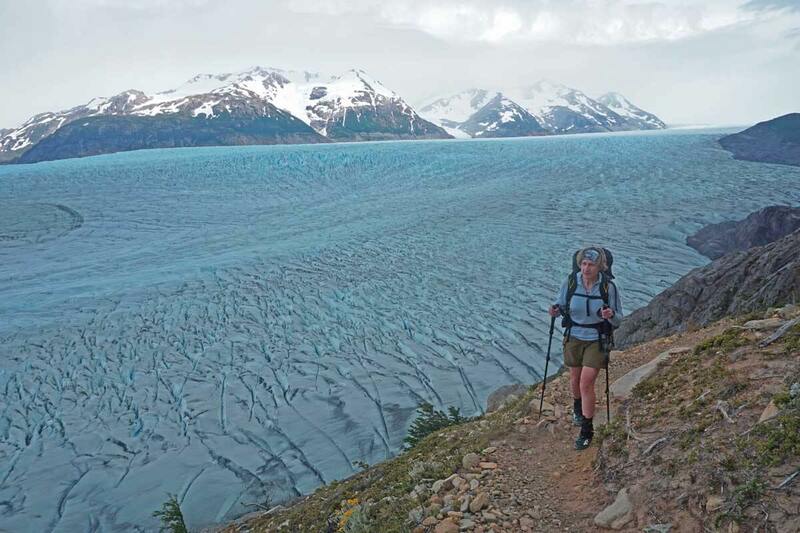 If you only do the W Trek you’ll miss walking along this incredible river of ice. It was our favorite part of the Torres del Paine Circuit Trek. Alison’s ULA Ohm 2.0 Pack is probably carrying less than 11 lb (5 kg) at this point in the trip. This is a companion piece to an overall guide to Trekking the Torres de Paine. The main post: Torres del Paine Trekking – Quick and Easy Guide to Essential Trip Planning has gear lists, food lists, information on campsite reservations, busses and ferries, park maps, GPX files, and other essential information to plan your trip. CONAF continues to make logistical changes to this trek over time. Check this grey box for the latest important changes. Below are the top informational items to note for your trek for the 2018-2019 season. Campamento Torres (área de acampar Torres) will be closed for the 2018-19 season! This has significant implications for the W Trek, As a backup until this resolves, you could consider booking Campamento Chileno (Área de acampar Chileno) with Fantastico Sur. It’s plus an hour or a bit longer hike up to the Torres de Paine (vs. C. Torres), but still doable. Because they have the monopoly, last year they only booked hikers who paid for full meals. Expect the same for the 2018-2019 season. There is an 80 Person Per Day Limit on the Circuit Trek (and it can only be done counterclockwise). Note: As of Sept 2018 CONAF is now charging the entrance fee when you book their free campsites. In addition, the process is now more complicated. Below we give you detailed guidance on how to best book your reservations. *Note: Can’t get a site on Vertice/Fantastico? Switch to ‘book in chilean pesos’ – yes it switches to Spanish, but google translate can help you out. The back page of the Official 2017 Park Trekking Map now has cutoff times listed for many trails—that is you need to start hiking before that time to reach your destination. This is now strictly enforced. This map will still get you everything you need for the trek. WHEN CAN I BOOK MY RESERVATIONS? Below are three additional buttons—one has the rates for the 2018/2019 season, one is the booking form (you can email the form to make a reservation — may take a while), and the last is their policies including cancellation info. For the 2018-2019 season, their refugios in the W are open Sept 2-April 30, and in the Circuit November 1-March 31. Vertice: Has their 2018-2019 dates posted already and it looks like they are booking reservations . Their W refugios are open September 1-April 30, Circuit November 1-March 30. Check their website for latest prices. CONAF: ****IS NOW OPEN**** But you still cannot book more than six months in advance (180 days before you go) for their sites of Italiano (open October-April) and Paso (open November-April). NEW INSTRUCTIONS FOR THE CONAF SITE: Scroll down to the “RESERVAR CAMPING CONAF” click on that link; next, you will see the entrance fees for the park. The campsites are still free. However, CONAF is now charging you the entrance fee when you book these free campsites so get ready to pay. Click on “comprar entradas.” Now you will need to set up an account with CONAF. Use the “pasaporte” user access (‘RUT’ is for Chilean residents). Once registered, follow the instructions to book the dates you need for each of the campsites (Italiano and/or Paso). CONAF will automatically charge you the $21,000 CLP entrance fee in addition to booking your sites when you check out. WHEN DOES THE PARK REALLY OPEN? Over the years we have received reports of some confusion and disarray in TdP, particularly around opening dates. So, keep in mind that the required booking system is still somewhat new to the park and clearly causing a lot more work for Fantastico and Vertice employees. As such, there is bound to be a difficult transition from the older, more free flowing system to this new stricter one. Our advice would be to continue to try and keep the communication lines open by contacting all parties, CONAF, Fantastico, and Vertice using all email addresses, Facebook, and phone. Also keep in mind that all three of these agencies are distinct and most likely do not communicate amongst themselves. You are the only thing they have in common which puts the burden on you to figure out what is going on. “OFF SEASON” April 30 to sometime in November: Most Refugios and Private Campamentos close during the off season. Backside of O/Circuit guided only. As of April 30 Most, most Refugios/Private Campamentos (Fantastico Sur and Vertice) are closed for the season. You can still camp on the W but obviously there will be far fewer resources. The “Backside” of the O or Circuit Trek (Serón, Dickson, Los Perros, Paso John Garner, etc.) is closed unless with an official guide. They will re-open to general use/travel at the start of the High Season, usually sometime in November. Looking for Something to do after Torres del Paine? Or are you finding reservations difficult and/or campsites booked? Then checkout out our guides to these two incredible off the beaten path Patagonia Treks — Chile’s exciting New Patagonia National Park Trek Guide and the Cerro Castillo Trek Guide. No reservations required and you’ll see far fewer people. The Cerro Castillo Trek is nearby and equally stunning. When, combined with the New Patagonia National Park Trek you have almost two weeks of fantastic trekking in a much less traveled but exciting region of Patagonia. Glacier Frances from near Mirador Frances. It’s typical in Patagonia for peaks to cloud in mid to late afternoon. You will be taking the catamaran both to and from Refugio Paine Grande, so buy a round trip ticket on your ferry ride out to Refugio Paine Grande. When you get to P. Natales go directly to CONAF (Park) office (Closed Sat & Sunday) and make campsite reservations for free campamentos (Italiano and Torres fill quickly). Floor of Valle Encantado with wildflowers in full bloom (at least when we were there). One of the highlights of the Torres del Paine Circuit Trek. 4 to 5 hours and 12 km, 7.5 miles (to Mirador Frances). This is a half day starting around noon. Hiking on good trails (and with just a daypack to Miradors [viewpoints] in Valle Frances). Be first off the bus at Laguna Amarga Entrance stop (around 9:30 am). Pay entrance fee & get permit. If you didn’t make campsite reservations for free campamentos do it now. The free campsites on the W like Campamento Italiano & Torres fill fast. If you can’t get a reservation at C. Italiano, for a small fee camping at R. Frances is quieter and nicer. Get back on bus to and arrive approx. 10:30a the Pudeto ferry dock (Catamaran on Lago Pehoé). Ferry leaves at 12:00 or 6:00 for Paine Grande. (Realistically in high season it may be going back and forth almost hourly). We got a “10:45” ferry and got to R. Paine Grande around 11:15 am. You pay your fee on the ferry–no advance reservations taken. Buy a round trip ticket since you’ll be taking the ferry back at the end of the Circuit. No matter where you are camping, drop your pack at Campamento Italiano (very safe everybody does it) and kit yourself out for day-hiking. Hike to at least Mirador Frances for a stunning view of the hanging Glacier Frances. We were less inspired by the hike up Valle Frances to the Mirador Britanico which is a lot more trekking for a nice view of a high cirque. If you are short on time and energy M. Frances is the bigger bang for the buck. Round trip stats for M. Frances: approx. 4 km, 2.6 miles and 2.0 to 2.5 hours. Round trip to M. Britanico 11 km, 6.9 miles and 4.0 hours. 2017 update: Please note that the trail to Mirador Britanico now closes at 3.00pm/15.00 and is strictly enforced. As such, it’s tight to make it to C. Italiano off of the 10.45am Catamaran (arrives at Paine Grande around 11.40am) in time to trek to M. Frances. To make it work: be the first off the ferry, don’t stop long or at all at R. Paine Grande, and instead hike quickly to C. Italiano. Once there, drop your packs and hike briskly up to M. Frances to beat the closing time. Once back down, get packs and if you have a reservation pitch your tent at C. Italiano. We camped 1/2 hour further down the trail from C. Italiano at the new and nice R Frances. Good tent platforms. Best hot showers and bathrooms of the trip by far. Small store and they serve meals if you have reservations (we managed to talk them into seating us for dinner day-0f but it was very tight). 7.5 to 9 hours and 28 km, 17.5 miles to Campamento Torres and a trip up to M Torres. This is a very pleasant alpine walk along the shore of Lago Nordenskjöld to R. Cuernos. After R. Cuernos take the cutoff trail (well marked) to R. Chileno (very nice store!). And then hike up to C. Torres. This camp has minimal facilities (dirt sites, no showers, basic cooking shelter, no tables). Not so great bathrooms. Your alternative is to camp at R. Chileno but that adds an extra hour each way for the hike to the Mirador las Torres, making it a 3.5 hour round trip hike vs. the 1.5 hours from C. las Torres. C. Italiano to R Los Curenos – 1.5 to 2.0 hours, and 5 km, 3.1 miles. The shortcut to Refugio Chileno is about 40 to 60 minutes hiking from R Los Cuernos. If you have time (you should) and the Torres are clear of clouds, consider hiking the 45 minutes up the steep trail to Mirador las Torres to see the famous Torres del Paine. It is also beneficial to familiarize yourself with the steep trail if you will hike it in the dark the next morning to catch the Torres at dawn. Round trip – 1.5 to 2.0 hours and 2 km, 1.3 miles. We arrived early enough at C. Torres to hike up for an evening photo at the Torres Del Paine. While not clouded in, the late day overcast did not make for the best of photos. The pictures at dawn the next morning were much better although I needed to hike in the dark to get them. Note that we have reports of bugs from Serón to Grey. We use the following on areas not protected by clothing: DEET (or the newer Picaridin which doesn’t degrade clothing or plastics). We prefer airline friendly 0.5 pump sprays, which are small, pocketable and easily applied in the field. Alternatively, for around $6 USD you can get spray at Cruz Verde Pharmacies in Puerto Natales. Alison dropping down to the Rio Paine in Valle Encantado on the way to Campamento Serón (backside of the Circuit Trek). All the almost white, flat ground in the distance is actually blanketed by wildflowers. From C Torres hit the trail at approx. 8:00 am or earlier. Hike to Hotel Torres. Be prepared for droves of day hikers heading up from the Hotel. The earlier you get down the fewer hikers you’ll have to dodge around on you way to the hotel. Best food store of the trip is the Kiosk in parking lot of Hotel. Also there is a nice cafe at Refugio Torres. Beautiful views from cafe tables. One way stats from C. Torres to the Hotel/Refugio Torres: approx. 2.0 to 3.0 hours,and 8.5 km, 5.5 miles. A peek at the Southern Andes and the Vast Southern Ice Field. Nearing the end of Valle Encantado on the way to Refugio Dickson. Backside of the Circuit Trek. Arrive Campamento Serón. Nice cooking on a covered porch. We ate our best sit-down dinner of the trip here. Sketchy hot showers. Decent store with wine and beer. Serón has fairly exposed campsites. (We saw a tent snapped and crushed here by the wind.) If windy, the best tent locations are right up against the fence at the base of the hill. You can even tie a few guylines to the fence. 7.5 to 9.5 hours and 29 km, 18 miles to Campamento Serón. This was one of our favorite hiking days—spectacular scenery. Another day of fast hiking on excellent trails. Beautiful views of the head of Valle Frances, then Lago Dickson and Glacier Dickson, and finally Glacier Perros, and Lago Los Perros. Day starts with a long walk through superb alpine meadows to R Dickson. Incredible wildflowers when in bloom! Also, we got our first views of Heilo Sur. One very steep, but short climb in the first hour of hiking. You will need to register at Ranger Station after you leave private land and reenter the park (no payment needed). 4.5 to 5.5 hours and 18 km, 11.2 miles to R. Dickson. Refugio Dickson has great views from their camp site (views of Heilo Sur and surrounding mountains in all directions). Lago Dickson is picturesque with Glacier Dickson flowing into it. Campsite has significant mosquitoes if wind is calm. Relatively unprotected cooking area (picnic tables) if wind is strong. Some camping in woods. Camping in field out of woods is quite unprotected. Nice, well stocked store. Lago Perros and Glacier Perros. You exit a long stretch of woods and get this exquisite view 10 minutes before reaching Campamento Los Perros. From R. Dickson, it is a very pleasant walk through a lovely forest to Campamento los Perros. Steady but moderate climb on good trail. Keep on the lookout for Magellanic Woodpeckers with their neon red heads. You get an incredible view of Glacier Perros and Lago Perros from top of the terminal moraine just before reaching C. Perros. (You can always drop your pack at camp and come back). 3.0 to 4.0 hours and 11 km, 6.9 miles. Super nice Marmot tents, already setup with ground pads inside can be rented for around $12, allowing for a fast start in the morning (they set up the tent for you, you just leave it and go in the morning). Register with Rangers at Los Perros. Most hikers leave in groups to go over Paso John Gardner around 7:00 or 8:00 am the next morning. This is encouraged by the Rangers as they feel it is safer for hikers to travel in groups. Rangers have say on go, no-go for attempting Paso John Gardner. Both strong wind and white-out are reasons for them close the pass. PJG is notorious for extremely high winds coming off of Glacier Grey and the Heilo Sur. An earlier start is almost always better. Dirt campsites at Los Perros but well protected. Super nice tents can be rented for around $12, allowing for a fast start in the morning. Nice store. Best cooking area of trip. Large room with lots of windows and lighted at night. Alison fights a strong headwind for the final push over Paso John Gardner. When we woke at 5:30 am. at our camp below the Pass the wind was already blowing 25-30 mph. We quickly packed up and got the hell out of dodge before the Rangers were around to close the pass (which they had done the previous day). It was windy on the way up but not horrible. We could still walk/weave a bit over the actual pass which had the strongest winds. On our trip Alison and I left Campamento Los Perros around 6:30 am as wind was already blowing 25-30 mph in camp. It’s a boggy and rocky hike up to the pass, but well marked. About half the hike is in the woods protected from wind. Other portions are rocky, exposed and can be quite windy. We had to hike through a few small snowfields at the top, which were a bit slippery in the early morning. Final 100m vertical to the actual pass was quite windy. We were buffeted by the wind and weaving a bit as we crossed the actual summit. Fortunately, the trail quickly descends (down and to the left) into protected woods on other side. The most incredible views of the trip unfold as you go over the pass. Glacier Grey, a 4.5 mile wide river of ice flowing down from Heilo Sur (the great Southern Ice Shelf) and the Southern Andes completely covered in ice and snow. The tip of Glacier Grey many miles below you is calving icebergs into Lago Grey. Hiking right along the side of Glacier Grey on the way down from Paso John Garner. You’ll get views that few in the park get of this massive river of ice. It is a very steep descent in woods on a decent well-maintained trail with many stairs and even some handrails. In short, you are descending from the pass along the ice river until you reach R. Grey. The views are incredible the whole way down. It doesn’t take long to reach Campamento Paso. This not the best campsite on the circuit by a long shot. It is small, unattractive and offers virtually no amenities. C Paso’s redeeming features are that it is well protected in the woods, and is in a key location in relation to Paso John Garner. More steep downward trail hiking takes you to R. Grey. (The closer you get the Refugio the more crowded the day hiker scene becomes. These are mostly W trekkers making the hike up from the Refugio Grey to miradors of the Glacier.) There are two new Indiana Jones worthy suspension bridges (not for acrophobes) that span nasty gullies. These bridges are tons of fun! There is also one sketchy steel ladder (ala Indiana Jones—sections tied together with cord). Not for acrophobes! The park recently added two Indiana Jones worthy suspension bridges between Campamento Paso and Refugio Grey. They speed crossing two deep gullies full of loose rock. The bridges are quite high, long and swing a bunch when you are in the middle. Make sure you stop at the Mirador about ½ mile above R Gray (well marked). Great views of the glacier as it goes into Lago Grey. You are right above the tip of the glacier as it feeds into the lake. R Grey has tons of services meals, food stores. Dirt camping in woods and in a grassy meadow. From R. Grey, its a non-trivial hike to Paine Grande with a fair amount of up and down along the shore of Lago Grey (or it could be that we were getting tired at this point). It can be very windy. Lots of hikers with both W Trek backpackers and hordes of day hikers coming from Refugio Paine Grande to miradors of Glacier Grey. We found it difficult at times to get around groups of hikers. Paine Grande is a stopping point for day hikers (those staying overnight at RPG, and day trippers from the ferry). Pretty big campsite in back (but very unprotected from wind) and nice Refugio with all services including mini-mart and cafeteria. Nice bathrooms/showers for the campsite. This Refugio gets a lot of traffic since it is the stopping point for the Catamaran so people coming/going all day long. We caught the 5:00pm catamaran back to Pudeto. Last boat of the day leaves at 6:00pm. Buses leave Pudeto (last stop at end of day), at 7:00pm or when the last catamaran gets in. So there’s no premium to getting to the catamaran stop early. Although there’s a decent cafe with sandwiches and good views of the Lago if you do get to Pudeto early. View from the Third Mirador (Mirador-Grey-03 on my map) where you can see Glacier Grey calve icebergs into Lago Grey. It’s only a short walk from here to Refugio Grey. We realize that day 5 may be a bit longer than some hikers prefer. In this version, Day 6 is a very short day—approx. 3 hours hiking time. This gives you almost a full day (3/4 of a day or more) of contingency hiking time in case of bad weather on the trip and to still make the last catamaran of the day out of R Paine Grande on Day 6. On day 6 hike to Refugio Paine Grande in time to catch the catamaran to Pudeto where you can catch the bus to Puerto Natales. 2.5 to 3.5 hours and 11 km, 6.3 miles. This table is just a starting point for planning. You will need to estimate your own hiking pace based on your abilities and pack weight. I read through your website and the plan that you did for the O circuit looks GREAT, so I want to follow in your footsteps and do it in 4.5 days this coming December. I have no issue knowing how to book the first 3 campsites Frances, Chileno and Seron on the website but when it comes to booking Los Perros through the Vertice website it doesn’t seem like it will allow me to only book Los Perros unless I book Dickson too. How were you able to only book Los Perros? Any help with this will be great appreciated. Thanks for the great guide and amazing site. We are beginning to plan a trip to do the O Trek next Christmas (2019-2020 season). Any idea if they plan on reopening Camp Torres by then? Thanks for the reply. I have another question about camera gear. I have the Sony a6500. Would you recommend just bringing the kit lens? I also have the 18-105 as an option, and I have been eyeing the new 18-135. Do you think the kit lens is adequate, or should I bring one of the bigger lenses? Thank you for this absolutely gem of a blog. I am planning on doing O between Apr 15 and 30th. You mentioned that Apr 15 is the cut-off for doing the O without a guide but elsewhere, this date seems to be Apr 30th. Is there a way I can confirm if the O w/o guide cutoff is Apr 15 OR Apr 30th. Thanks again. Follow up question to my earlier post. We are hiking the W, from Feb 15-19. All campsites/refugios are reserved as well as bus reservations. We will stay first night Feb 15 at Refugio Las Torres camp (on my reservation from Fantastico Sur it says “Camping Central Sitio Suelo” so I assume this is Torres Central Camping?) and hike the W from that direction ending at Paine Grande. What I am hoping to find more info on is what to expect when we get off the bus at Laguna Amarga. I believe this this one of the park entrances? We already purchased our Park Entrance fee through Conaf. So not sure if we still need to wait in line or just show our entrance fee papers in a separate line? And from here, i see on one map it is about 7 km to Refugios Torres Central camp. Is that accurate? So we get a nice starter hike in off the bus? :) Can you direct me to any information or provide a quick summary of what we should expect or any tips when we arrive at Laguna Amarga? Apologies if this has already been covered in your post. I am trying to plan our O trek for Dec 2019 and honestly getting a bit confused and overwhelmed with the information regarding actually booking the campsites. I understand that you are not a booking agency and we plan to contact the campsites direct to make our reservations but i’m a bit confused as to which companies run which campsites. Would you mind confirming if i have the below correct? 21/12/2019	Day 7	Torres Ranger Station	? This will be part of a bigger trip around Chile & I would like to secure the reservations on the trek before we book any other internal flights & hotels etc. Thank you so much for taking the time to gather and share so much information. My wife and I are are heading to TdP in April. Our original plan was to hike the O circuit. However, it seems that both Fantastico and Vertice’s camp sites in the North part of the park shut down at the end of March. We were going to follow your 6 day itinerary for the trek. Are there any options to do the O circuit with Serón, Dickson, and Perros all shut down? Are there guides to take you through the Northern half? Right now we are scheduled to get to PN the 9th and were planning on trekking the 10th-15th. Per the our guide “OFF SEASON” April 30 to sometime in November: Most Refugios and Private Campamentos close during the off season. Backside of O/Circuit guided only.” But if you complete the route before then you should not technically need a guide although the weather by mid-April will definitely be colder with a real chance of snow. In particular, Paso John Garner could be quite challenging. As far as the campamentos, you should be able to pitch a tent there but there will be no services. So unless your skills are high, it might be better to get a guide, even if one is not technically required. You could check with Erratic Rock or some of the other guiding co’s in Puerto Natales. So yes, getting the backside of the O guided, an then possibly transitioning to doing the W yourself might be a good plan. Let us know how you make out. And wishing you a great trek. Warmest, -alan & alison. Hi Alan – Great resource, super glad to have found your site! Day 4 (Feb 18)- hike to Paine Grande. (I cannot find availability here through Vertice). Day 5 (Feb 19) – hike up to Gray’s Glacier as far as time allows, then backtrack to Pain Grande to take catamaran to Pudeto sector and bus back to Puerto Natales. So my challenge is not being able to find availability at Paine Grande for night of the Feb 18. With the other campsites I have reserved, do you have a suggestion on how to finish the last bit of the W? Acampar Italiano is also fully booked. Los Cuernos still has an opening, so maybe spend the night of Feb 18 there again and have a big last day of hiking from for Los Cuernos, through Paine Grande, as far up towards Gray’s Glacier as time allows and then back to Paine Grande in time to catch the last ferry of the day. This last day could be up to a 21 mile day if we went all the way from Los Cuernos to Camp Gray and back to Paine Grande. Thoughts? Thanks for your quick response Alan! I tried again on the Vertice website just now and I am still getting a message that there is no availability at Refugio Paine Grande or Grey (i dont even get option to select camping or beds) for the night of February 18 2019. Is there another website that you are checking? Or do you think it’s best to call/email Vertice directly or is there another vendor that has camping/beds at those locations? Also, I wasn’t super clear on my itinerary; on Feb 18, my plan was to hike from Los Cuernos, up the French Valley, back down and then to R. Paine Grande to spend night there if possible. Tent camping fine for us, I plan to bring tent, bags, pads for us. Hi Alan – update: that new app is super helpful. Thanks for the tip. I visited the Vertice website several times over the past week and was finally able to make reservations for 2 camping spots at Paine Grande. They must have just opened up some availability. So I have all my nightly reservations now. Great! Follow up question: I am seeing different information about the catamaran from Paine Grande to Pudeto Sector. Are reservations required? Or just show up at the pier with plenty of time to spare? I believe I saw there is a scheduled 6 pm departure? I’m a bit confused. I’m reading of a lot of people starting the hiking at Hotel Las Torres and camping the first night at Seron and skipping the cataman trip. Is this possible? Having a really difficult time piecing campsites together as some are booked out while others are not… Any advice would be appreciated. Also seems free campsite Torres is closed for 2018-19 season? If you don’t do the Torres right off the start and start at Hotel Las Torres, the downside of going to to Seron is that if you run into weather or delays you might not have the time at the end to do the complete W and thus would miss the Torres. This was our rationale to take the Ferry and start at R. Paine Grande. That way we knew that even with bad weather we would complete the W and get the views that we wanted. If you are only doing the W, starting at R. Paine Grande gives you a chance to day hike up to Glacier Gray (arguably the best view of the trip) and then pickup your packs and make it to C. Italiano or R. Frances on the same day. first of all I would love to thank you for all you tips and guides and recommendations, your website is excelent!! I started planning the trip to torres del Paine for February 2019 and I would like to ask you about arrival to the National Park Torres del Paine. According to our flight tickets, we are supposed to arrive at Punta Arenas Friday evening. Is it possible to get on the bus on saturday morning to Puerto Natales and then continue directly to the Park in the afternoon? Or is it necessary to stop over in puerto Natales in the CONAF office and start the hike next day morning? I suppose we would have all booking already done. We thought that we would sleep over in Refugio Palne Grande and in the morning we would start the circuit trail immediately, i.e. we would avoid the crowded morning at the entrance. What do you think of that? Do you think it is doable, as I see everywhere that people start the first day on the puerto natales’ bus stop. You’ll need to check the PN to Pudeto bus schedules online. As far we know the Bus Schedules are your most accurate source of what busses run when. They will be your best source to see if there is an afternoon bus from PN in time to catch the last ferry from Pudeto to Paine Grande (also check ferry schedule). I believe that you can pay for your park entrance fee ahead of time on the CONAF website. At least I do know that they automatically charge you the entrance fee when you reserve a CONAF campsite. Note that if you are on a large public bus, you’ll need to wait until everybody on the bus has paid their entrance fee before the bus proceeds into the park. Your other option is to take a bus to the Hotel/Sector Central end of the Park and camp there for the night. That way you take the ferry out of the mix. Mimi was going to leave early in the morning and hike directly to the Torres from there. Note that in either case you’ll need to have all your reservations done well ahead of your trip. One possible option, if you really wanted to get to the park the same day you travel to PN, is that you might arrange some sort of private van/shuttle to the park if you were willing to pay the $ (might be feasible is you shared it among a number of people). It is always possible that there will be more bus service in high season — that is not currently posted. But again, you would not want to bet your campsite reservation and whole trip schedule on that happening. Still seems like an early next morning bus, is your least complicated and least expensive option. Just wanted to add something to this awesome guide. So it looks like for 2018, fantastico sur’s website is up and running now. R Chileno got booked up today and same for Frances. I’m not sure when the FS website first went up, but i checked only a couple days ago. I wish I had emailed my reservation. Oh well, it took me some time to figure out my plans and logistics. I emailed FS about R Chileno and *fingers crossed* will post updates if I get R Chileno. If not, well I’m happy to still be able to do the O.
P.S. I didn’t want to spam all your Torres pages, but if you’d like I can post this in the other pages so others are aware if they look at only one of the pages. Great resource and thanks for keeping it updated. We are trying to see if we can save on weight by renting at each campsite. I know the Veretice and Fantastico can rent all the goodies but not sure about the CONAF sites. Do you know if they offer tent rentals too? Thanks the info. I think we’ll just end up skipping Paso. I’m thinkin about just going from Grey –> Paine Grande –> Frances in 1 day. Then the next day go backward a little from Frances to the Valle del Frances and back down passed Frances to Los Cuernos. Do you think that plan sounds OK? Have to reiterate the THANKS for all your great resources. My childhood/lifelong friend and I did the O loop according to your itinerary in early Feb. We’re 50, and I felt this itinerary even with a shortened last day in 4.5 days was plenty challenging (especially realizing that many guide books suggest twice this long – though they do not reflect how much faster the new swinging bridges make the last day). We had some of the problems others have mentioned (difficulty reaching Vertice, catamaran service delays) and some that others have not mentioned (flooding rivers with substantial but well-marked reroutes; chronic back problems flaring up just before the trip). Lucky to have this opportunity and that it went so well. We really enjoyed having the preset tent @ Chlieno (the only option), as it was pouring all night. Once we paid for that, the dinner was a delicious and social add-on. If I were doing this after another 10 years of aging, I might consider using more of these (carrying just a quilt and not tent), and appreciate that they might enable me to do this with a wider variety of companions. Vertice would not let us reserve Perros or Dickson without having Grey or Paine Grande, which were both full. Our (expensive) alternative was to take the tourist boat out of Grey. I must admit I was just as happy to not have a second 18 mile day in a row, especially one with the pass, and 11.5 on that last day (Perros over the pass and to Grey) was perfect for taking time to take in the most beautiful day of the trip. A couple of other plugs – 1) great advice on the quilts, this was my first experience with those; 2) Viento Patagonico is a great place to stay in PN; right price, very helpful & friendly, near the bus station. My partner and I were wanting to do the O Circuit in April but some of the campgrounds (i.e Dickson) are closed. We could just wing it and see if we can organise it when we get there but would prefer to be more prepared! We are thinking we could book the W Circuit (campgrounds are available) and then when we get there if the campgrounds in O Circuit are open can we go through to Camp Grey. Is this something that would be possible? 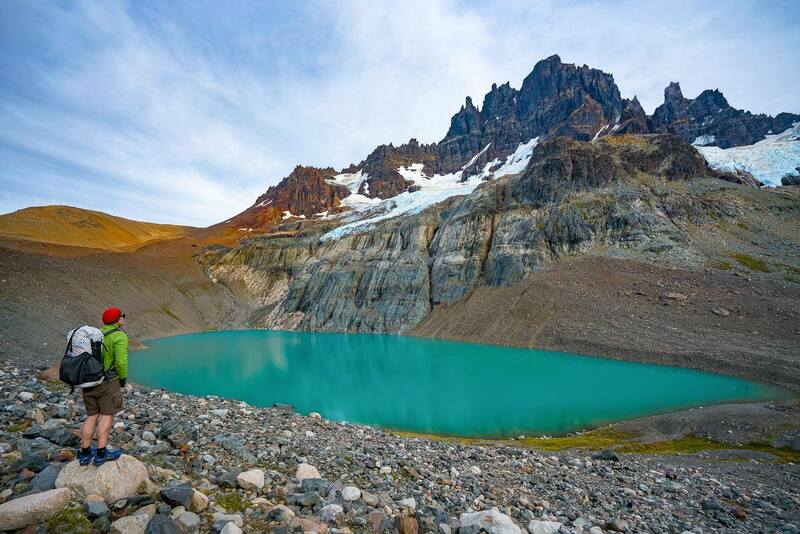 Cassie, per the header to the main page of this guide, Torres del Paine W Trek and Circuit Trek – Quick and Easy Guide to Essential Trip Planning. As of April 15 the O is officially closed to non-guided travel. “April 2017: Most Refugios and Private Campamentos closed for the season. Backside of O/Circuit guided only. Hi Alan! I’ll be starting the Circuit at the main park entrance (Las Torres hotel) rather than Paine Grande (I’ll do the “W” last). After a lot of last minute arranging I managed to book the first few campsites. Could you take a quick look at the days I’ve planned and let me know if you think it’s ok, and provide a suggestion for where I should stay the last 2 nights (how to finish off the W)? I’ve done a lot of long distance hiking. Day 5: I think Mirador Las Torres in the morning and then I’ll be finished. Hi Ellie, glad you are exited about trekking in Torres de Paine! As to your schedule Q. First, Los Perros –> Paine Grande is a very long day. So you’d need to be absolutely sure you could make it (more on this below*). And we have had reports of Rangers not approving this Los Perros –> Paine Grande [and possibly Serón Camp –> Los Perros] because they believe that people might not be able to reliably hike it that far in a day. This is complicated with the Rangers controlling access over Paso John Garner. That is wether you can go over and when you can leave. The day were were there they wanted to us to wait until 8:00 in the morning (and in S. America that could be later) and group us up with other hikers. [Instead we left in the dark and went solo.] Finally, I am not sure how you intend to get to Mirador Las Torres in the morning of Day 5. It’s a fair distance from Paine Grande to there. Also complicating things is the closure of Campamento Torres, leaving Campamento Chileno (Área de acampar Chileno) the only game in town for a close place camp at before hiking up to the Torres del Paine… The next two places Los Cuernos and the Hotel TH accommodation areas are much farther. * And apologies, but I can’t specifically answer the Q as to whether your itinerary is feasible for you. I simply do not know how fast you hike, how far you can hike, and how much time you spend stopped vs. hiking, etc. I can say that the intermarry Alison and I did is fairly aggressive (but certainly doable) schedule for fit backpackers carrying ultralight packs. And even tho you didn’t ask but just to be clear, we we aren’t a booking agency. As such, we have no special access to V, FS & CONAF. So, your best strategy is to deal directly with V, FS & CONAF yourself (if you haven’t already booked campsites/accommodations). After many many weeks of emails and phone calls I have managed to book some sites with Vertice for end of December. Good job Sal. Way to stick at it. And in December! The park is experiencing big problems at the moment. When I arrived the Conaf rangers were on strike and many people entered the park for free. I didn’t, but when I went through the entry no-one asked me for my reservations like we were told to expect. When I finished the O all the Fantastico workers at Los Cuernos and Central were on strike and the guides stepped up to keep food and beds going. Everywhere we were given conflicting information: Seron was closed (it opened the day I got there but was still a mess with builders working with noisy grinders at 11pm); the Coiron ranger said I could go to Dickson but no further, supposedly because the Los Perros toilets were not working, even though he also told me about parties going on through (I exploded and said why didn’t you put up a sign at the start of the track rather than letting us get this far — one couple ahead of me turned back); the Dickson ranger said we could go on; there was no ranger at Los Perros and the toilets were all working fine! In comparison to the Fantastico chaos the Vertice sites were wonderful with much better food and facilities — the complete opposite of the booking experience! There seems to be zero communication between Conaf and Fantastico/Vertice and obviously conflicting agendas: Conaf don’t want more tourists and the companies do. I am not sure how this will pan out but there are many rumours! Oh, and as far as I know, the ‘O’ or Circuit Trek is still not officially open to unguided traffic yet this year (it’s always open to guided trips). Was supposed to open Nov 15 but that didn’t happen. Still unguided people are currently risking it and the closure does not seem to be actively enforced. But this could change at any time. Thanks Alan for quick reply. Ah, well, will stick with the W only.Seems they don’t really want people on O circuit. Vertice has given me extra grey hairs and an ulcer in past month! we were hoping to replicate your itinerary this December however, Vertice isn’t letting me book Los Perros without booking Dickson and refugio grey . Refugio Grey is booked out for the day we ll need to break the last day . They are saying its impossible to do Los Perros to Paine Grande in a day and CONAF would turn us back. Did you guys run into this problem? Sal, please see the comment thread with Beau just above yours in these comments. Vertice is what it is. LP to PG is definitely doable in a day, especially at the hight of Austral Summer and with light backs. That being said, you may not be able to convince the Park of it. You could try to see if anything is open at C. Paso. > Did you guys run into this problem? And no, we did not have this problem, but that was before the more stringent park regs that started in January of this year. The Park was not checking for reservations along the circuit before allowing you to continue. A quick note for anyone reading this due to do the O soon: I am in P Natales and have been told that Seron is not yet open! I have booked and paid for meals and a tent rental there and I have no tent to take with me nor do I want to carry one for one night. So we shall see . . . ! I’m working on getting all my campsites in line. I’m having trouble with Vertice. I received a confirmation email of my book request back in September, and have sent 6 follow up emails, but haven’t received any information on how to actually book or pay. Any suggestions? Is this just a case of continuing to email? Thanks for the reply! I reached out via facebook and that seemed to work since I got a reply via email. Unfortunately, they said Gray is completely booked. I checked Camp Paso and that is booked too. Do you have any suggestions as to how I can still complete the circuit with those two places fully booked? Your blog is brilliant. Thanks so much for sharing so much invaluable information. My partner and I are planning to do the “O” in Jan 2018 (struggling with finding the mandatory bookings currently…) and are looking to copy your route. We’re both reasonably fit, 29 and 30, but not particularly experienced hikers – multi-day trekking is new to me certainly. Two questions for you – Though you guys did it in less, we are naturally a little concerned of committing to the pace you guys set – it seems 90% of sources recommend 8 or even 9 days. Which seems long to me. We seem to move at about 2-3 miles per hour on day hikes usually. Secondly is your route – most otters seem to start and end at hotel las Torres – why did you guys start at Paine Grande? Is there a benefit to this? Any idea what happens if you plan for the O circuit but need to turn back before the pass, for example due prolonged weather delays, health issues, etc? I see the arrows on the official park map go counter clockwise, but cannot see another route out. I imagine the park rangers need to let people go clockwise to get back to Seron/Torres/etc, but thought I’d seek your opinion. Update, I received an email confirming my reservation with VP. As the 48 hours was close to ending and multiple emails with no response. I called Vertice to make sure I didn’t lose my reservation. There is no way to pay over the phone. After you respond to the confirmation email they will send you a link but may take as long as three business days. I will update when I receive the link. Finally able to book Vertice 10 days after receiving confirmation email. I received the email with the pay link and paid online. After day nine I went on and made a reservation again because of my concern that I had lost my reservation. The next day is when I received the link. Not sure if that made a difference or not. Thanks Alan for this website. super helpful!! Hope your trek on AT was enjoyable. Hi Alan, it’s Vik again. I’m in the process of making reservations, and noticed that Fantastico Sur is fully booked at Refugio Chileno for the night we are planning to stay there. Do you know of any workarounds/alternate campsites we could stay at in the same general area? Thanks for the help! Hope you had a great trip, Alan! Unfortunately, none of the alternative lodging options near Chileno have availability. I have reservations made at Acampar Frances and Seron, however there does not seem to be camping availability between the two spots. Do you have any recommendations for what to do? There’s about 32 miles between the two campsites, which isn’t impossible to do in one day but if there’s some way we could camp in between that would be ideal. On a separate note, when do you recommend booking flights? If prices are only going to go up between now and December, we’d like to purchase tickets ASAP. Thanks a lot!! Alan, Did you travel with trekking poles and stakes or did you rent them from erratic rock? Wanted to give an update and both websites FS and V reservations are working, I already have my FS confirmed, and waiting on V response. I put them in yesterday. Thanks bdgrover13! Were you able to pay for your VP reservation? We submitted a reservation request & received an email requesting we submit payment within 48h, but with no link to a payment site and no response when we’ve tried to email them to inquire. Thanks for everyone’s help! Just curious when you are planning on traveling to TdP. I tried the sites last night and today and was unable to make reservations for March 2018 on FS (unable to confirm booking in Pesos or USD) despite it showing availability. I was also not able to reserve a CONAF site as it seemed like it was too far in advance. I was only able to reserve a site on V, but am still awaiting confirmation. I am going in december. I was able to book with CONAF and FS but still no response from VP. It Seems that both FS and V are overwhelmed by booking inquiries due to the new park regulations requiring advance bookings, so maybe we have to cut them some slack (even though you could say they could have got their websites functioning properly to avoid this!). FS have issued me with a booking form in reply to an email request. V say they are taking bookings after Sept 1. This is a great and informative website! I am planning on doing the Circuit Trek in November, and just had a question. Do you or anyone thats following know if there are flights to and from Puerto Natales? Thank you for your time! Many thanks for your detailed post, it is definitely the most useful I have come across in planning our trip to Patagonia to do the O circuit in February 2018! I am having trouble booking with Fantastico Sur and getting any response from them. It seems they have opened up there reservations on the website. I was wondering if you had heard if anyone had experienced difficulties booking Camp Chileno as Camp Torres is closed. When I try to book it is not even an option on the reservations page. Also, they seem to only have the option of booking Camping at Seron, and if you want to book at Frances it says you must book ‘Platformus Premium’ which is 160 US per night for 2 people. Interested to hear whether you have heard anything about this! Really appreciate your help! Thanks Alan. One more question: Can I do the O backside without taking tent or cooker? The only problem seems to be C Paso which does not feature in either of your private company lists — so is it a free public one? If I need a tent and dinner do I have to push on to R Grey? David, that should mostly work. I believe that Los Perros does not serve meals. That being said, they do have a reasonably well stocked store in camp that you could easily cobble something together for a no-cook dinner and breakfast (or possibly borrow some time on somebodies stove). Or you could buy food at the much better stocked store at Dickson and carry it up to Los Perros. As long as you reserve ahead of time, tents should be available at Seron, Dickson, Los Perros, and Refugio Gray. Hi Alan. Thanks for a wonderful and generous resource. I came here for details on the W and O hikes, but have to say I am now daunted by all the restrictions and crowding: strict camp reservations, strict cut-off times, no off trail walking, etc. Is it worth it now? Do you know Patagonia well enough to recommend another area which might not be quite as spectacular but makes up for it with the freedom to walk where and when you please and the weather allows?! If I did stay with TdP would it be silly just to do the O backside from the hotel round to Paine Grande (incl a day trip up to Torres)? If so, is there a bus back from Pudeto to Hotel Las Torres? Hi David, understand your concerns about the increasing red-tape/restrictions around TdP. Yes, I do think that doing the Backside of the O would be a good idea. A lot more chill and less crowded than the W. The view from the top of Glacier Grey/Paso John Gardner is amazing! And then the early start dayhike up to the Towers would be good as well. As of last year you can take the buses between the entrance and Pudeto as long as there are seats, the cost is ~$4.000 CLP. But I would advise you to check with the Bus Co’s to confirm. My guess is that you might be able to hitch between the two since people go from the Hotel to see Salto Grande (water fall) at Pudeto. Thanks Alan. We are not camping so I am working on booking lodging on Refugio’s meaning bed and full board that seems not to be open for reservations. Do you know any other way to recommend me that is worth trying to book two beds and full board, (breakfast, packed lunch and dinner at the Refugio’s on W-Circuit? Hi Alan, Thank you for all the information and your prompt responses to people questions. I plan to hike the W-Trek from East to West with my girl friend starting October 1 2017. Our plan is 4 nights and 5 days in the park. I have been trying to reserve refugio’s full board for two past 2 months with no success. I have been emailing back and forth with Fantastico Sur and spoke twice on the phone. They keep saying the rates are not confirmed yet so they can not make reservations. We bought our flights to be in the area on September 29. Unless I reserve the logging in refugio’s, I will not feel relaxed. Is there any advise you can provide regarding securing our lodging reservations? Thanks in advance. Unfortunately we don’t have the definite rates for next season. That is why we haven’t reply you back. As soon as I have the information we will send it back to you. Thank you so much for all your efforts in putting together this incredible comprehensive website. I am currently planning my visit to Torres del Paine at the end of December. While I will certainly take on the W trail, I am also interested in the O circle trail. Based on your experience, is there any scenario that would allow to skip camp sites altogether and hike the entire O trail without the need to camp, i.e. Refugio to Refugio? I appreciate this might be challenging, given the distances, but do you know of any folks who may have tried this in the past? I think the answer if very close but not quite. The difficulty will be Los Perros at the base of Paso John Garner, which has only camping. It’s at a key position for an early/safe start over the pass. As such, it would be quite difficult avoid spending the night there*. This is especially true since the rangers control starts over the pass from there (earlier is far better as they can shut it down for wind and or fog as the day progresses). And most trekkers will need all the hiking time they can get to make it to Refugio Grey from there the next day (and thereby avoid Campamento Paso). You can rent a tent and sleeping pad at Campamento Los Perros and buy food at the Alimentacion (food store) there. So you would only need to bring your own sleeping bag. (We actually rented a tent here to get a faster start in the morning. It was quite a nice tent.) If you look at my sleeping bags page, you can get a warm and light bag for around 1.5 pounds or less than kg. *Were you attempt R. Dickson to R. Grey (you might not get to the pass in time to safely cross over). But more critical is that according the park map it is over 15 hours of hiking from R. Dickson to R. Grey which includes some serious climbing and descent over Paso John Gardner. Our times were more like 10 hours to cover that distance, but we had light packs and were moving quickly. So theoretically it is doable. But you’d have no margin or a backup plan for bad weather, high winds, (the rangers shutting down the pass) and/or you just didn’t end up moving quickly enough. And any of those are quite possible in TdP. Thank you, Alan – really appreciate your insight and thoughts! I definitely won’t take the chances here and probably just go with the W trail this time. On this note, though – am I right to assume that it is not allowed to hike just parts of the circle route? In other words… if I decided to start at Refugio Paine, then make my way up to Refugio Grey, but instead of going back the same day, could I keep walking toward Camp Site Paso (i.e. Part of the circle trail in clockwise direction), then turn around after a few hours of hiking and stay at Refugio Grey? This way I could soak in some of the glacier Grey views without actually hiking the O trail. I guess technically this is not allowed as the O trail has to be taken in counter clockwise direction, but I wanted to see what your thoughts are on this idea? Same idea btw would apply to Las Torres… could I walk toward Sermon for a day trip, and then return / take the trail at the crossing and return to Refugio Lagune Amarga? Stephan, a day hike from R. Grey to see the upper parts of the glacier would be most excellent! A good plan! Go as high up as you can. Don’t know of any constraints on hiking that section out and back as a day hike. A friend and I are planning a trip to do the Circuit Trek late this December, and I recently visited the websites for both Vertice and Fantastico Sur only to find that all campsite reservations are already sold out. Am I out of luck entirely or is there any hope that spots will open up at some point? I didn’t realize they’d fill up this quickly.. Thanks so much for this guide and your help! Thanks a lot, Alan! That is definitely a relief to hear. Do you remember approximately when the reservations opened for each of them? I just want to make sure I don’t miss them at all. I was able to successfully (after about a month and a half of back and forth) book campsites with Vertice via email. I have not had luck with Fantastico Sur, however. Thanks so much! I’ll definitely shoot them an email and hopefully can work it out. I am so grateful for your prompt reply. I am 33, quite fit and a disciplined hiker. Last year I hiked up to 5,500m at the Himalayas. I am planning to start my hiking early, around 7am. I will leave a lot of my stuff at Puerto Natales and I will rent the tents, so I will have a light weight. After reading your reply, I am confident I can skip Dickson and hike directly to Los Perros from Seron. I will be well prepared and download the apps you suggest. THANKS a million! I will email you end of December once I am back home from my journey in Patagonia! I am thankful there are people like you eager to help others without asking anything in return. Vertice suggested that I stop at Dickson. They informed me that CONAF will allow me to do the route Seron – Los Perros only if I arrive at Coiron by 11am and at Dickson before 2pm. They, also, emailed me that they have not received a similar request in the past, i.e. to bypass Dickson. I will have to depart very early from Seron but this is no issue for me. The issue is that Vertice informed that solo travellers sometimes get lost. I am a female, solo traveller and my concern is that if I pass Dickson at 1pm, will I be able to join other people who would start from Dickson at 2pm? How late do people start hiking? Cati, glad you find the guide useful. I don’t think you will get lost between Seron and Los Perros if you pay attention. Trail was fairly obvious and navigation is straightforward. Not sure why they said solo hikers get lost. And you can always carry a GPS or an iPhone with App See my posts on this. And there is a .gpx track on my post that you can load into it. And there is even a GPS iPhone App for TdP although I have not checked it out. I doubt you would need either, but you could use them if it would give you a sense of safety and security. As to making cutoff times: assuming you go around Dec/Jan/Feb you’ll have tons of daylight, being that far south and near summer solstice. My suggestion would be to start early. Alison and I only took 2 hours to Coiron and then another 6 hours to Los Perros for a total of 8 hours. Park says 10.5 hrs (hiking times on the backside of the park map). There are some quite steep hills on the way to Coiron and Dickson and then it is a gentle but fairly steady climb from Dickson to Los Perros. Elevation profiles are on the park map. With an early start you should have the best chance to make either of those times. Thank you so much for this very helpful guide! I am in the process of booking my reservations for the last 2 weeks of October, but I haven’t been able to find out when the full O circuit is open. I heard that in 2016 it opened November 1st. I’m worried that the Dickson and Perros campsites won’t be open until November this year. Do you know anything about this? Quick question – what’s the rationale for starting from Refugio Paine Grande, vs. the other common starting point near the Torres/Camp Seron? Hi Chris. Starting at Hotel Torres is just fine. So no real reason you’d need to start at Refugio Paine Grande. I’m chomping at the bit to get campsites and such booked for our late December/early January trip, but having reached out to Fantastico Sur and Vertice Patagonia, they won’t even open for reservations until early/mid-June. The Campamento booking site also looks to be unavailable for 2017/2018 for now. One unrelated question Alan – do you have any experience with the zPacks Triplex tent? That’s my wife/my go-to backpacking tent, but we’re wondering whether it will survive the high winds. Thanks for all the info – you’ve compiled an incredibly helpful resource! We’re hoping to do the circuit this April 16-21, following your 6-day itinerary. However, as these dates are after the campsite reservation season is over, we are unable to reserve sites on the back side (Seron and Los Perros/Dickson). I’ve repeatedly contacted Vertice, Fantastico, and the national park to ask if we’ll be able to camp at the closed campsites on the back side in the late season without reservations (since reservations cannot be made), but have not heard back. It’s pretty clear from what’s written above that back-side camping without reservations would not fly during the high season. Do you know if it’s possible during the post-season? If not, we’ll adapt. But it would be great to get around the back! Thanks for the awesome guide. It has been an huge help! Based on your experience do you see any issues with this schedule? I know it is aggressive and we will probably only get to visit Mirador Las Torres once in the evening. I wish we could add another day but time is an issue unfortunately! Joey. Taylor, that seems like it should be doable for a fit hiker. 5 days is certainly doable. I think we ended up doing it in about 4.5 days and I am in my mid 50s. BUT especially in April you are going to have less daylight and some iffy’er weather. Your challenge will be getting over Paso John Garner in good weather. Leaving from Dickson (vs. Los Perros) even at dawn might get you too late to the pass if the wind is getting up or it’s starting to fog in. And the Rangers will close it if they think it’s not safe, so it will be out of your control. The Park will likely let you slide on campsite reservations given the Wx delay. But if you have to be somewhere or have inflexible reservations post hike, that might be a problem. In summary, late season with less daylight you might want to add a weather day to your schedule, if not for campsite reservations at least one at the end of the trip. Now as to your personal hike schedule… Not knowing how fast you hike, your start/stop times, weight of packs, and how much you stop, and how efficient you are with your time, etc. it’s hard to make a definitive comment on your schedule. I suggest you look at the hiking distance tables in this post and the parks times here. Then make your best guess as to whether you can comfortably make the daily distances. Some data from past backpacking trips or even training hikes can be a help. You can also see my post on training for backpacking which has some info on estimating hiking times based on your training. I will note that none of the hiking is particularly difficult and the trails in general are good. I also have a post coming out in a few days on how to be most efficient with your hiking–might give most people an extra hour or two of hiking time each day. Efficient Backpacking Tips – Easily Increase Mileage & Fun. I’ve looked at your hiking distance table, which was very helpful, and it looks doable. Obviously it’s very important to be aware of the closing times and we’ll have to be disciplined with our hiking. The Dickson to Grey will be a challenging day and we will have to leave pre-dawn to get to Paso John Gardner early enough, but we’ll be travelling light (renting tents from the refugios) and we have an extra day on the end just in case. I’m very happy we will be able to do the full circuit because it was a challenge to coordinate everything. Your guide was an immense help though! Thanks very much! We followed your itinerary and had a fabulous trek with no issues whatsoever. Your guide to Torres and doing the O circuit is the best I could find online or otherwise. We attended the Erratic Rock lecture and nothing they talked about was new to me, thanks entirely to the comprehensive information on your blog. Thank you for sharing all this information with us and in such a step wise and not-so-overwhelming manner. This is the best website out there for information on trekking in Torres del Paine! Thank you for taking your time to compile such an awesome resource. I will be heading to TDP in early April but realized that the first day of my hike falls on a Sunday. Is anyone aware if the bus and catamaran services run on Sunday? I am looking to take a bus from Puerto Natales to Pudeto and then catch the catamaran to Paine Grande. Will this be feasible on a Sunday? This is such a great resource! You’re right that information on the trek is completely fragmented and often inaccurate. Quick question for you as someone who has already completed the trek – I’m looking to do it in 7 days, and am pretty limited by campsite availability. Do you think the following route would work? Not knowing how fast you hike, your start/stop times, weight of packs, and how much you stop, and how efficient you are with your time, etc. it’s hard to make a definitive comment on your schedule. I suggest you look at the hiking distance tables in this post and the parks times here. Then make your best guess as to whether you can comfortably make the daily distances. Some data from past backpacking trips or even training hikes can be a help. You can also see my post on training for backpacking which has some info on estimating hiking times based on your training. I will note that none of the hiking is particularly difficult and the trails in general are good. I also have a post coming out in a few days on how to be most efficient with your hiking–might give most people an extra hour or two of hiking time each day. Thanks a lot for the feedback! Ideally, I’d like the stop in Los Perros, but I think it’s all booked up during my dates. Based on the time tables, I’m thinking it should be fine. I’m in reasonably good hiking condition after 6 months in South America, but am planning to take some of your tips on training for the next few weeks. Thanks for the info, and will keep you posted on how it goes! I am in the process of planning a trip to TdP in November or December of this year – and I absolutely LOVE how detailed your site is as it relates to planning. I am having a lot of issues in trying to book campsites along the “O” trek. – CONAF will not allow me to book for November/December at this time – but they have “no availability in September/October” and then the week after their “no availability” I am served up a message that says I am too early to book. Do you know how far in advance I should be able to book a site through CONAF? – Fantastico Sur will not let me search for availability beyond March 2017…again, do you know when November/December reservations would open here? I have emailed all three of these organizations independently and have not heard back – since you are so knowledgeable on this topic, I thought that you might be able to help me navigate this or have a little insiders knowledge? Thanks so much in advance – and THANK YOU for the detailed information here. Wondering if any of the organizations got back to you. Looking to make reservations for Jan/Feb 2018 and wanted to know when the earliest I can booking is. Thanks!! I just heard back from Vertice patagonia and they said that reservations will be available for upcoming year in June. Hope this helps. I am looking to go in december. Thanks so much for all this fantastic info! If the pass is closed or itinerary gets off-schedule for some other reason, what do you do with your pre-reserved sites? Alan, your blog is a phenomenal resource, and a serious inspiration. Thank you VERY much! My wife and I just booked a 14-day trip to Patagonia, and we’re looking to follow your advice for the O Circuit. However, we’ve budgeted 6 nights/7 days (wife is very nervous about doing it in 5 nights/6 days, and we’re a bit lacking on the lightweight gear) – any thoughts on how we should modify your itinerary for the extra time? More time is better. Given that the weather can be unpredictable in TdP having some extra time and even a wiggle room day makes a lot of sense! E.g. some days the Rangers may shut down Paso John Gardner to high winds and or white out conditions. But as to your exact schedule, not knowing your start/stop times, hiking pace, weight of packs, and how much you stop, and how efficient you are with your time, etc. it’s hard to comment on your schedule. I suggest you look at the hiking distance tables in this post and make your best guess as to whether you can comfortably make the daily distances. I will note that none of the hiking is particularly difficult and the trails in general are good. Finally, you should be able to get some good info on your actual hiking pace (and get some good trip conditioning) by doing some training hikes with packs on. I have a good piece on exactly this: Quick and Efficient Training for Backpacking and Hiking. Thank you so much for posting all this information! My sister and I will be doing the O circuit in 5 days and reserving tents at Seron, Perros, RPG, and Frances. We will also be bringing our own food and snacks. I see that you used a cord to hang up your food at night. Is there a high chance of animals sneaking around if we kept our food/trash in a sealed bag in our packs? Thank you gain for all the info! Thanks to you both for the info. I can’t wait. Leave for TDP on 2-26-17! This is a very long comment. Sorry. But I just returned from Torres del Paine and I thought it was worth sharing this detailed update. I did the 6-day version January 16-21. I am a 61-year-old male from New York with problematic knees who did this as a solo trip. I saw numerous women doing it solo and spoke extensively to two. Neither was aware of anyone having any problems. I carried all my food and was carrying a bit more weight than Alan or Allison. I got a nasty sinus infection the day I started and had a bit of a sore throat for part of the trip. I am not a particularly fast hiker but everything was fine. I don’t think I saw anyone over 30 between Perros and the Pass. Here is what I have learned. This is all your-mileage-my-vary kind of stuff since the situation changes constantly and one ranger or campsite manager may be quite different from another. 1. They were superstrict about having reservations. I met two Australians who thought they could just make camping reservations when they showed up and they had to limit themselves to day hikes instead. Make all campsite reservations well in advance and print out hard copies.. I had to show these many times. One time I lost my patience with a ranger, complaining when he asked not only for the current night’s reserva but future nights as well. He explained that he was just doing his job and I apologized and thanked him for working to keep us safe. I did meet a group of Chileans with full packs on my Day 2 afternoon day hike up to the base of the Torres mirador. I asked one of them why they didn’t leave their giant loads at the Torres campsite. He explained that they didn’t have reservas. Given how frequently I was being asked to show my reservation, I would not recommend this as a strategy. Also, the rangers might cut Chileans a bit more slack if they caught them stealth camping. But it is the Chileans’ public resource and it’s just wrong for us, as guests, to overuse it. 2. Learn as much as you can before you go. This page is by far the best. But read widely. I say this because you never know what’s going to happen. The day I entered the park (Jan. 16) the catamaran broke down. The park personnel boarded our bus in Laguna Amarga and told us it would probably start running at 2 pm. I was in a panic since I had all my campsites prereserved. I was not at all happy about getting on a 2 pm catamaran and wasn’t real confident that it would be up by then anyway. So, I changed plans, took a small bus to Hotel Torres and walked to C. Italiano the first day. Then did the day hike only to mirador Francés since it was late, there was bad weather, and it was past closing time to see Británico. I later realized that during my trip closing times were not being enforced. But you have to be flexible. Turns out the catamaran still was not up by day 6, so I ended up walking the tail of the Q from Pudeto to CONAF Administration to take the bus out of the park to Puerto Natales. This, of course, was not my original plan but it was all good. I learned about the online CONAF reservation system by pure luck when I saw a link on the CONAF site. Once I had my CONAF reservations, I figured I was already locked in, so I might as well make the pay reservations too. 3. Wet-foot / dry-foot. No, I am not referring to US immigration policy with respect to Cuba. I am talking about trail runners vs. more traditional hiking boots. Alan argues for the former. A few days before I departed, I saw that there is an Erratic Rock daily 3 pm presentation up on youtube where the presenter supports Alan’s position. Yet the day I went, the Erratic Rock presenter said you have to have sturdy boots. My takeaway is that either works, as long as you know what you are in for. Don’t bring boots unless you are very confident that they will keep your feet dry after 5-6 days of continuous rain, mud, fording streams and walking trails that are themselves streams. If you doubt your boots can stay dry, then don’t bring them. 4. I regret not bringing my own food. The best strategy is to bring sealed food and declare it upon entering the country. There is a small risk that your food will be confiscated. But it is unlikely. And I think it is a risk worth taking since I could not find the food I wanted in Punta Arenas or Puerto Natales. 5. Like Alan said, show up early for the bus to the park. Although I had a 7:30 am reservation. I got on a bus that left at 7:06 am. Given the fiasco with the catamaran, it was worth it getting there early. 6. If you are having trouble making online campsite reservations with US dollars try making them in Chilean pesos. I tried to make reservations unsuccessfully for a couple of days. It only worked after I changed the currency. Maybe this is no longer a problem. This was the most ambitious trip I’ve taken in decades, maybe in my entire life. I am not exaggerating at all when I say that without Alan, this trip would not have happened. Thank you Alan. Nice job Mike. 6 days at over 60 is awesome! And so glad you enjoyed the hike–it is indeed a spectacular. All good info on the park and much of it jives with what others have written me as well. There is a penguin colony near puerto natales as well. At least there was 20 years ago when I lived in Punta Arenas. Thanks for the wonderful information. My husband and I are heading down to Patagonia in February to get in some much needed hiking. My question to you: what other hikes would you recommend in Patagonia? Are there any that you would recommend over the O? Also from El Calafate you can easily see one of the great natural wonders of Argentina, the Perito Moreno Glacier (scroll a fair amount down to see the pictures).. It’s one of the few advancing glaciers in the world–it moves about 7cm each day. Because it is constantly moving, vast blocks of ice fall off the face of the glacier into the lake, calving icebergs with an explosive detonation that sounds like a bomb going off. The other incredible destination is to fly to the Atacama desert. This is where Alison and I went last year post TdP. It is the driest non-polar desert in the world. Amazing salt lakes and wildlife! We saw 3 of the 6 world’s flamingo species while there. Amazing star watching, possibly the premier astronomical research location on the planet. There is El Tatio an immense caldera with its many geysers is in the Atacama Desert at over 14,000 feet (4320m). Its name comes from the Quechua word for oven. It is among the highest-elevation geyser fields in the world. El Tatio has over 80 active geysers, making it the largest geyser field in the southern hemisphere and the third largest in the world. Oh, and from Punta Arenas possibly PN you can see King Penguins in Terra del Fuego. This Penguin Colony in Terra del Fuego is the ONLY colony north of South Georgia Island. That’s a BIG DEAL! Otherwise you need to get on a boat and go the Antarctic to see them. Alison and I did an epic 18-hour day trip from Punta Areas to Terra del Fuego to see them for just an hour. This included endless hours of bad dirt roads and two insane and dangerous ferry crossing of the Straights of Magellan in 100kph winds. We got to look at these beautiful creatures for over an hour. Could even see the eggs they were incubating on top of their feet. A privilege that few have had. Incredible! I am wondering how you take your bag and gear on the plane and through customs? Do you take other luggage if you plan on sight seeing as well (i.e. layover in Santiago)? Do you put everything in a big duffle bag? What do you do with the duffle or extra clothes/luggage while backpacking if you even take other stuff? I know that is a lot of questions, I just want to try to control what I can control to make sure it goes well. Thanks for your help. Thank you for the great work and detailed itineraries. I am in the process of planning my circuit hike with a couple of friends on January 7th, and the information you provided here has helped a lot. I was able to reserve some campsites, however, there’s zero availability of campsites/refugios for my last two nights in the park. Do you think it would be possible to reserve these sites in Puerto Natales? or if the online sites (CONAF, Fantastico Sur, and Vertice) show no availability then this is the way it is? Your thoughts on that would be much appreciated. Reservations in Chile take a bit of elbow grease: To get our reservations right, we had do do a combination of online research, online transactions and emails with FS and Vertice. No right way to do this. You just have to work it with some patience and perseverance. And yes, the online reservations for the free park campamentos has made all campsites (free and pay) a bit scarce during high season. You could try to book the free CONAF campsites at their headquarters in PN but not sure what they could do for you (other than possibly have some knowledge of last minute cancellations). The same can also be said for FS and Vertice (but there you might have a better chance at a cancellation since people stand to lose money if they don’t show and don’t cancel). Hi Alan, thanks for posting all this awesome information. Would you mind giving me a quick breakdown of where you spent your nights? It’s hard to tell which campamentos/refugios you actually slept at vs. which ones you merely passed through. My friend and I now have to book sites in advance, and CONAF sites are booked up for our time frame. Would be nice to know which campsites on the second half of the circuit you would recommend, especially considering potentially having problems crossing Paso JG. We will camp at Seron (night 3), but sleeping which sites after that would work out best logistically to complete the trek within 5-6 days and split up the hiking in a reasonable way? Thanks! As to other options. Camping at R. Dixon looked really nice. R. Grey camping looked OK but was certainly crowded–whole area kind of a zoo, altho there’s a lot of amenities. Camping at C. Paso did not look very nice, altho great views of the glacier from there. Hi Alan can I ask what month you went? Im trying to avoid high season so thinking Feb/March or Sept/Oct…. Thank you for writing this – very informative! We are doing the Circuit next year and are trying to gather as much up-to-date information as possible which has proven a little difficult. This is probably a stupid question, but you mention “tent platforms” on this itinerary so I wanted to ask you if you think we will have any trouble setting up our tent. I am imagining a wooden platform of sorts and am not sure how that will work without dirt to push the stakes into. Any information would be super helpful! Thank you Alan. We have a North Face Mountain 25 and were feeling pretty good about it in terms of wind/weather resistance (since I hear the wind is bonkers down there), but I was a bit worried about the cords and stakes when I started reading about the tent platforms. I am glad you think it can be managed and we will bring some extra cord just in case. I also see your comment below about the new requirements for reservations on the Circuit – thankfully we are all set for reservations, we made those well in advance and are going to be there the first week of March so hopefully it is a bit less crowded at that time anyway. Here is another bizarre question that you may or may not be able to answer. Are you aware of the refugios being able to cater to people with specific food allergies? I know this response is much later than the planned trip, but perhaps it’ll help someone else. For the one night when we got full board (R Chileno, and lucky because it was pouring rain! ), we let Fantastico know that we had a celiac disease / gluten allergy (real allergy, not just preference). They were very attentive to this.